April 29th has been quite an eventful day in the history of railroading. On this day in 1851, the Baltimore and Ohio Railroad made its first test run of a battery powered electric locomotive. In 1873, Eli H. Janney was issued Patent #138,405 for a type of automatic coupler that is still in use by railroads today. April 29th, 1900 celebrated the inaugural run of the Northern Pacific's North Coast Limited rail line. And finally, April 29th, 1960 marked the very last run for the Southern Pacific Narrow Gauge rail line. If you are interested in looking up more "This Date in Railroading History" click here. A Great Site for Railroading News! For our model railroaders that also love the railroading industry, www.railnews.net is a great site that offers current events in railroading as well as breaking news about the industry itself. Railroad news from around the world is gathered and updated daily for railfans, train travelers, railroaders and train enthusiasts. On this site you can find everything from the financial reporting on your favorite railroads to bridge dedications and much more. If you are a railroading history buff, this website may be of interest to you. The state of Georgia has a long history with railroading, beginning in the 1830's. By the 1850's, Georgia had more miles of railroad track than any other state in the South. 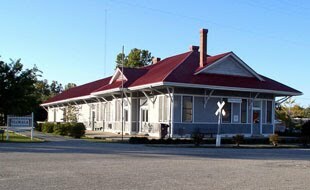 RailGA.com has been on the web for 12 years, updating curious readers about the history and heritage of Georgia's railroads from the earliest days to the present. We are still taking pre-orders! Remember that the deadline to submit pre-orders for the 2011 Lionel Volume 1 Signature Edition Catalog is coming up on May 11, 2011. To take advantage of this great program, click here. Weddings and Hoboes, and Train Depots! Oh My! This past weekend, one of our crew took a road trip to a little town called Florala, Alabama for a wedding. The wedding took place at the Florala Historical Society's L&N Train Depot. The building was built in 1902. There used to be at least four railroad tracks that ran through Florala but now there is only a very short section left. The building was beautiful and rustic, a perfect location for a wedding. The weather was absolutely beautiful and the bride and groom were able to get many comical photographs while posing on the ladder for the boxcar that is stationed at the L&N Train Depot. To find out more about steam railroads and Florala, Alabama, click here. Another interesting fact about the area is that the mascot of one of the local high schools is the hobo! Laurel Hill, Florida is very close to Florala, Alabama and Hobo Pride is alive and strong. Laurel Hill was once serviced by the L&N railroad and the town was home to many hoboes throughout the years. In fact, Laurel Hill not only pays tribute to the hobo by using him as a school mascot, but the Laurel Hill Hobo Festival takes place every fall! You can read more about Laurel Hill, Florida and their famous Hoboes by clicking here. All in all, it was a spectacular weekend in the quaint little town of Florala. The bride and groom celebrated their wedding night with an amazing display of fireworks and everybody went home happy! Trainz.com wishes to congratulate the happy couple. We are pleased to announce that the Lionel 2011 Signature Catalog Volume One and the Lionel 2011 Tinplate Catalog Volume One are up and running on our preorder page. Place your order by clicking here. The Spring York Train Meet starts on Thursday and Trainz.com will be there! If you are in the area we welcome you to come by and say hi! For those of you who can't make it out, we still encourage you to stop by our website. We recently received an awesome collection of Marklin HO scale items and we are starting to list them on our site. www.trainz.com Happy Railroading! New and Unique HO Scale Items at Trainz.com! We recently acquired a large collection of new and unique HO scale items. Our auction writers have been feverishly working to get these items listed so that we can offer our customers the best selection of model railroading products on the web! Check out what we have in stock here. In other news, Trainz.com will be attending the York Train Show next week. If you are in the area we would love to hear from you! Happy Railroading! Reminder: We have 1,500 products at up to 30% off! This is just a friendly reminder to all our valued customers to keep checking our website at www.trainz.com. On any given day we feature over 1,500 products at up to 30% off! We are also beginning to list items from the large Marklin HO collection that we got in a week or so ago. Happy Railroading!